For decades the model remained the same. Now the rules are being rewritten. The commercial manufacturing category has long relied on a selling strategy that is still relatively intact across the Fortune 500 today: Invite clients to a showroom at headquarters flick on a PowerPoint and do your best to get visitors to sign on the dotted line before they head back to their corporate office. Make no mistake: It worked—albeit to varying degrees. But the problem was that as time went on the products being sold became more sophisticated but the platforms from which they were marketed didn’t. At Boeing it was no different. The company was bringing customers and prospects to a facility just outside of Seattle where visitors could peruse mock-ups of new aircraft and learn about Boeing’s business solutions—everything from maintenance and operations to retrofitting options for airplanes—through standard presentations given by sales representatives. But the business has changed and so has the sales and marketing approach powering the world’s largest aerospace company. Looking for customers to recognize the company as something other than an entity that just writes billion-dollar contracts for airplanes Boeing has tweaked its branding approach. Now it’s positioning itself not as a manufacturer but as a “lifecycle partner”—as a company that will provide its customers with business solutions through the full lifespan of the products they buy. A new approach demands a new way to connect with customers and Boeing has found just that through its embrace of experiential marketing. A commitment to engagement-based selling has sent a ripple throughout the org chart and the result is an enterprise-wide dedication to a new form of marketing a shift exceedingly rare in a category as huge as Boeing’s. Face-to-face engagement is now getting big play across the entire marketing mix and it’s paying off. After losing its status as the category leader in 2001 Boeing regained the crown in 2006. The company recorded 1 050 orders (and $60 billion in revenue) last year compared with Airbus’ 824 orders. Global marketing programs are now spun as holistically connected yet locally relevant endeavors tied to the new Boeing brand. 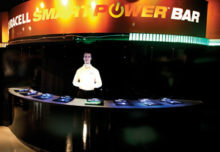 Trade shows are now more about creating an immersion than a spectacle. Media is designed to bring the brand to life. Press events strive to stamp an indelible message. And the old-school sales approach of inviting prospects to watch presentations and look at mock-ups has literally been thrown away replaced by a high-tech all-touch Customer Experience Center that goes leaps and bounds beyond traditional sales demos. It’s a fully interactive customer experience that actually delivers on its name and the live embodiment of Boeing’s bold new tack. “We realized that if you have the most state-of-the-art products in the world how you represent yourself has to be done with state-of-the-art marketing techniques ” says Rob Pollack Boeing’s vp-branding. Upon entering the 30 000-square-foot space customers tour interiors of four airplanes—the 787 777 737 and 747-8. 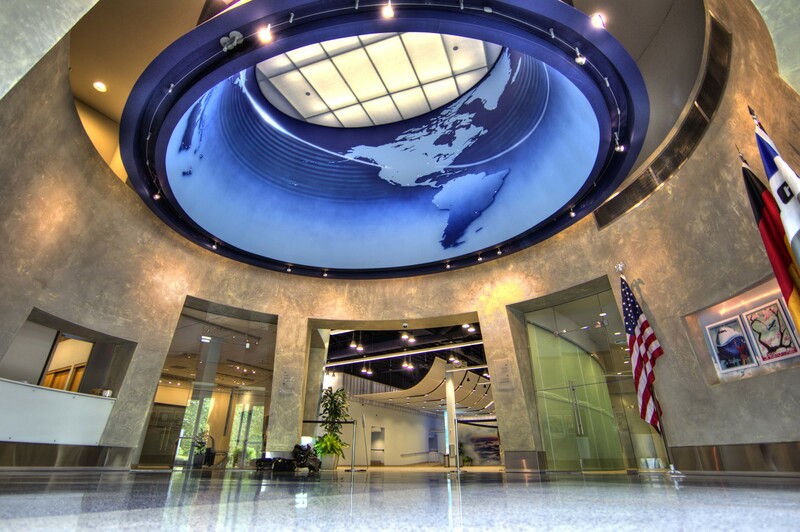 Conference and research rooms provide space for in-depth meetings between Boeing executives and customers beneath a domed ceiling featuring lit cities on a circular map. Curved walls and ceilings reflect the arcing lines of the livery displayed on the much-buzzed-about Dreamliner 787 aircraft. From there comes the experiential piece de resistance the Customer Solutions Studio. A completely customizable answer to the challenge of illustrating Boeing’s not-so-tangible services which include retrofitting aircraft interiors to handling supply chain management the Studio lets customers see touch feel and taste the new Boeing—all in an appealing and digestible format. From the time Boeing’s marketing team began planning the Studio which opened last spring there were two primary goals: First the space had to speak to a number of audiences from ceos and vps to operations managers. Second the content had to be completely interactive with the experience powered as much (or in some cases more) by the customer as by the Boeing reps who accompanied them. Boeing’s new facility is part of a trend that’s seeing executive briefing centers throughout Corporate America receive major face lifts—and the trend is due in no small part to an injection of pure unadulterated experiential marketing. Because of the way it incorporates technology to enhance the environment rather than overpowering it and because of Boeing’s strategy of letting the client direct the experience EM felt it worthwhile to give you a personally guided tour. The Studio features a series of screens offering digital video that gives each visitor a full immersion into the services that Boeing offers throughout an aircraft’s lifecycle from acquisition to operations to upgrades and beyond. The room is entirely RFID-enabled which allows Boeing to seamlessly tailor every single tour based on who the visitors are. When guests from say Singapore Airlines enter the environment a Boeing rep swipes the card and the clients’ names and logo appear on a screen in front of them. Farther inside the Studio a screen capable of displaying flight activity around the world automatically eliminates all other routes except for Singapore’s worldwide maps. On another wall the client can view video of the interior of a Boeing aircraft. But with another quick RFID swipe the system customizes the virtual space to reflect the customer’s branding corporate colors and messaging. To ensure the RFID technology created the desired a-ha effect Boeing installed three card readers. One reader technically would have been enough to power the entire room but with three units—and three distinct points for Boeing reps to activate personalization—the customer can witness the customization of each area as they approach it. “It customizes the experience and lets the customer know [we’re] focused on their needs ” says Haro. Naturally Boeing reps—the team usually includes execs from sales and marketing along with subject matter experts who can address the client’s specific challenges—are on-site to answer questions and facilitate the experience. But customers are invited to walk through the facility at their own pace. To determine the right balance of content for the Studio Boeing drew from knowledge its event staff had gained over the years at events including the U.K.’s Farnborough International Air Show. 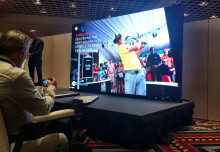 The company honed that interactive approach through additional learnings from trade shows. As a result of its event activations the team learned that different customers have different levels of interest in Boeing—and therefore are inclined to spend varying lengths of time with the company. At Farnborough and other expos some customers might only spend 10 or 15 seconds to chat while others might have more time for an in-depth meeting. The result of that insight is a tiered approach to content with various levels of messaging available depending on the customer’s time and interest. The conversations can be as long or as short as the visitor wants them to be. Each piece of content is layered to give the customer as much or as little as they want or need to know. Of course part of the suite was set up to allow sales reps to go to the old standby sales presentations. But even that area was designed to maximize flexibility and encourage deeper conversations than the typical stand-up lecture. A lounge area with plush couches and chairs in the center of the Studio encourages guests to linger; Boeing execs can still show big-screen slide shows without having to push visitors into a conference room. Having all of the solutions grouped together in one area has already impacted the way that customers are interacting with Boeing. Perhaps the most apparent change is that because Boeing can use the space to address a wide range of customers’ key concerns the environment allows customers to maximize the value of each visit to the company’s home base. In the past a customer might have only met with one or two Boeing subject matter specialists while viewing a new interior of an aircraft. Now having all of the solutions in one space allows several topics to be discussed in one visit without disrupting the flow of the conversation. The beautiful part is that it’s all working exactly the way it was envisioned. Customers are walking away with more information after choosing their own adventure inside the Experience Center. Sales reps are doing less pitching and spending more time engaging the customers. Leads traffic and business are all coming together. And although the venue is barely a year old Boeing is actively working on updates to the Studio and more ways to incorporate RFID and other emerging technologies. “We’re probably just two layers deep into the story ” Haro says. When Rick Kumasaka design director and senior industrial designer for Boeing was originally charged with leading the team that would create the Customer Solutions Studio the project specs were just a little bit different. The company’s initial plan was to incorporate existing assets from Boeing’s trade show exhibits into a space that was about half the size the final structure would become. But a few weeks into the process Kumasaka was given more room to operate and a new plan—to create a space that would allow Boeing to offer a total customer experience. Coordinating teams from six internal departments—exhibits and industrial design digital design video services 3D multimedia graphic design and project management—Kumasaka completed the Studio under a time crunch. Planning for the Studio started in November 2005. The floor plan building code regulations and engineering were greenlit in December. Boeing broke ground on the project during the winter holidays and the majority of the install took place in February. To ensure the Studio would offer the customer-driven experiences Boeing was after Kumasaka based his designs on three different scenarios: a five-minute meeting with the customer who had only a few minutes to spend and would visit the major mockup area in the Customer Experience Center; a 45-minute version that was more in-depth; and an hour-plus presentation that was an even more intensive look at Boeing and its solution services. “It was based on a guided tour with a salesperson leading the customers through one of those three different scenarios ” Kumasaka says.